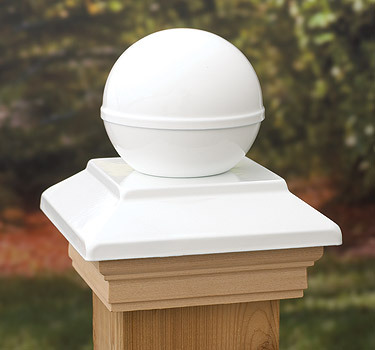 Deckorators Victoria Ball metal post caps top off your posts with a traditional, solid look. Made from the finest metals—such as copper, pewter, and stainless steel—they will add a decorative touch to your deck, fence or porch as well as other projects such as mailboxes and signs to docks and gates. Wood Skirt with Powder Coated White Ball Top- Dimensions: Fits Post Size 5 1/2" x 5 1/2". Actual inside opening of 5 5/8" with a pocket depth of 1 3/8" - These Post Caps are Available in Cedar or Treated. Ships out via UPS Ground (arrives in 3 - 5 business days).